In a rough London lane rife with villains, pickpockets and crooks, where racketing carts spewed their hay and where tumblers, stilt-walkers and merchants vied for the attention of the crowds, the Haymarket Theatre was born. This was a London of extremes, a city rebuilt, just sixty years after being swept away by fire. Now, in 1720, it was the biggest city in Europe and filled with the handsomely rich, living side by side with the wretchedly poor. It was here, among the ruffians and peddlers, that a young carpenter by the name of John Potter built his modest little theatre, nestled beside the ‘Cannon and Musket’ gun shop, on the current site of the Kings Head tavern. From the moment the theatre opened its doors in 1720, the ‘Hay Market’ (later the ‘Little Theatre in the Hay’) was plagued with troubles. For a start, theatres required a Royal Patent or Royal Charter, such as those granted to Drury Lane and John Rich’s Lincoln’s Inn Theatre, in order to operate, something Potter didn’t have. Desperate to keep his project from closure, Potter cast around for anything to put on stage, from concerts and amateur plays to the street entertainment at his door. But taking money at the door was illegal, and Potter found his investment closed regularly by the Constabulary. Things looked bleak for the little theatre until a visit from a French Duke brought most unexpected fortune. Arriving in London with a troupe of French Actors and a play, ‘La Fille A La Mode’, the Duke of Montague found neither of the Patent Theatres keen on presenting a piece in a foreign language. Rebuffed, he turned to the Little Theatre in the Hay, providing them with their first professional production. The play was not a major hit but, now established as a professional playhouse, the theatre’s reputation grew steadily until the first box-office smash in 1729. ‘Hurlothrumbo’, a 30-night theatrical spectacular, proved vastly more successful than anything running at the rival patented theatres. 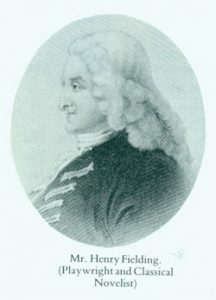 Hot on the heels of Hurlothrumbo’s success in 1729, a young Henry Fielding, fresh-faced at the age of 23 arrived from Oxford, hugely ambitious and brimming with ideas. Fielding headed straight for the Little Theatre in the Hay, providing a string of triumphant plays beginning with a burlesque, ‘Tom Thumb’, his first major success that packed the House night after night. Among his plays was ‘The Historical Register’, written in 1734, which contained a character by the name of ‘Quidam’, a villainous, bribing politician, instantly recognizable to the audience as their Prime Minister, Robert Warpole. The crowds fell in love with this thinly veiled disguise, packing the theatre to the rafters, but Prime Minister Warpole was enraged. In retaliation, Warpole introduced an Act that was to change the face of theatre for nearly three hundred years. In 1737, came the Licensing Act, granting the Lord Chamberlain unprecedented and sweeping powers of censorship. The Little Theatre in the Hay was closed down, effectively, for the next eight years and the Censorship Bill, with all its powers, was not abolished until 1968. The theatre reopened in 1741 with the arrival of celebrated classical actor, Charles Macklin. Already a star of Drury Lane, Macklin had a devilishly difficult reputation for being somewhat hotheaded, yet this unlikely figure provided the Hay Market with another groundbreaking ‘first’. Gathering a group of inspiring young actors, Macklin created what was very possibly the first drama school, with the inspired addition of an audience, present as his students trained on stage. Macklin managed to sustain this for some time, interrupted only by the regular Constabulary closures for taking money at the door. 1754 saw a change of administration for the Hay Market, as the flamboyant Samuel Foote, a celebrated mimic, stepped into John Potter’s shoes. Foote’s name was to become somewhat ironic as, handed a rather frisky horse at a Royal Hunting Party as a prank, Foote was thrown from his steed, breaking his leg severely and requiring amputation. Although he feared his career was over, the Hay Market was to benefit strangely from his misfortune. Horrified that the joke had so misfired, the Duke of York, a close personal friend and fellow guest at the hunt, asked if anything could be done for Foote. Immediately, Foote replied that all he wanted from life was a Royal Warrant and Patent for his ‘Little Theatre in the Hay’. Despite some reluctance from King George III, the Royal Patent was granted, with a proviso: it was to last only the summer months, and only until Foote’s death. The restriction was designed to avoid the now obvious competition with the two patent theatres. 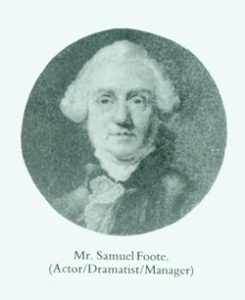 Victorious at his achievement, Foote agreed and, having refurbished and enlarged the building, the theatre reopened in 1767 as the Theatre Royal Haymarket. Meanwhile Foote, not done with his own theatrical career, launched into writing plays for one-legged roles, most notably ‘The Devil on Two Sticks’ and ‘The Lame Lover’. In 1777 the theatre changed hands once again, purchased by George Colman the Elder, who set about on further renovations. Originally, the Little Theatre in the Hay was built right on the street, so that the audience entered through cramped corridors, barely wide enough for two to walk abreast. What is more, once inside, they remained just feet from the racket of the wild Haymarket street, clearly audible to all within. So, in 1777, Colman built a small lobby between the road and the auditorium to block out the noise, and inside, he constructed three flat walls of three tiers of boxes, along with the orchestra pit and a gallery at the back. Despite the relative grandeur of this new layout, theatre going was still a raucous business, and the regular ‘patrons of the pit’ continued to hurl their missiles, usually oranges or other rotten fruits, at the actors on stage. George Colman however, was a dignified character. 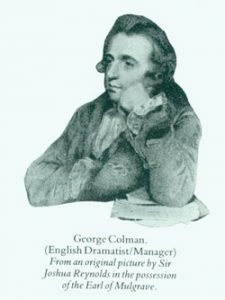 A playwright and friend of David Garrick, he staged Oliver Goldsmith’s first two plays at the ‘Little Theatre in the Hay’, which included ‘She Stoops to Conquer’, and employed some of the most prominent actors of the day. At his death he was succeeded by his son, known as Colman the Younger, also a dramatist, who wrote many plays for the Theatre. But Coleman the Younger was not blessed with his father’s business head and landed quickly in the Debtors Prison. From here, he continued to run the theatre, leaving frequently for dinner with friends, returning later to his suite. After several years, Coleman handed the reigns of power to David Morris, with whom he’d endured a stormy partnership. Their union was fraught and frequently descended into rows, one of which caused a riot in the theatre. In 1820, deciding that London was looking tired and old, the Prince Regent instructed architect John Nash to enhance the appearance of the city, redesigning its shabby fronticepieces with new awe-inspiring glamour. Nash had particular plans for the modest little Haymarket Theatre, envisaging a lofty, elegant frontage with a spectacular theatre behind. For optimum impact however, the architect insisted the whole building be shifted, south of where it stood, so that it may line up with St James’s Square. Morris of course agreed, and the work began. On the 4th of July 1821, the new Theatre Royal Haymarket opened with a production of Sheridan’s ‘The Rivals’. Nash’s new Haymarket Theatre was in many ways the same as the last. The interior sidewalls were still flat, all three with three tiers of boxes and containing the back gallery and the pit. The crucial difference lay in the splendour of the whole. The décor was ornate and opulent; the colours were pink, crimson and gold and the proscenium arch was supported by two massive marble pillars, lined at their tops with spectacular golden palm fronts. The theatre also sported what is now one of the few surviving raked stages, slanting away from the audience so that the actor, moving back, could be more clearly seen. Through the ensuing season, theatrical legends such as Edmund Kean graced this new stage, playing King Lear and Richard III among others. In 1837, Benjamin Webster succeeded Morris, placing the theatre once again in the hands of an actor-playwright. Under Webster’s watch, a progression of the finest actors, including the great William Macready, trod the boards, and a young Queen Victoria became a regular attendee. The Queen was to become friendly with Webster and, as a result, the Royal Receiving Room (now the VIP Room) and the Royal Box (now Box No.1) were created. Actor John Buckstone was next in line for the theatre, having played its stage for 20 years. Buckstone, also a firm friend of the Queen, brought many an innovation to the schedule, at one time running a series of up to 4 plays, back to back in one evening, which brought the final curtain crashing down at an impressive 1am. This he juxtaposed with a string of fast-paced farces bringing comedy back to the theatre. One notable success was Tom Taylor’s, My American Cousin, which involved one ‘Lord Dudreary’, who took London men’s fashion scene by storm with his dandified manner, elegant clothes and a set of outrageous whiskers curled to his shoulders. The demand for his look was (rather inexplicably) huge and even prompted a new entry in the dictionary. This now legendary character was created by actor Edward Southern and the play ran for 500 nights, the first extended run in theatrical History, making Buckstone a phenomenal sum of £30,000. In 1879, Squire and Marie Bancroft took the lease, altering the layout of the theatre once again. Doing away with the pink marble, they built a magnificent proscenium arch in the form of a gold frame and did away with the pit, to install the stalls as we know them today. The alterations caused uproar among the regular ‘patrons of the pit’, but in time they were placated, not least by the introduction of a new bar. The Bancrofts also introduced matinees, which remained for five strong years, until the theatre was taken in hand by the great Herbert Beerbohm Tree. A leading light in the London theatre scene, the larger than life Beerbohm Tree attracted glittering, fashionable audiences to his Opening Nights. One of the great actor/managers of the Victorian and Edwardian periods, all who met him fell under his spell. All but for George Bernard Shaw, at the time a critic, who had less than flattering words to impart about his acting prowess. These were wonderful days at the Haymarket, with audiences littered with the likes of Shaw and Oscar Wilde, swanning through the halls backstage, sparring with Beerbohm Tree, insisting on having cardboard tickets printed just for him. Two of Wilde’s most famous plays premiered at the Haymarket during this time, ‘A Woman of No Importance’ and ‘An Ideal Husband’, and Wilde, much in attendance, was a lively presence in the Royal Box. Taking for himself the role of ‘Falstaff’, Tree also brought Shakespeare back to the Haymarket, along with George Du Maurier’s ‘Trilby’ in which he saw himself as the ugly, evilhypnotist ‘Svengali’. He and Du Maurier cast the unknown young Dorothea Baird as the heroine ‘Trilby’, to huge success, making Tree a fortune. After 10 years in spectacular management, Tree moved across the road, knocked down Vanbrugh’s old Theatre and built Her Majesty’s Theatre, moving in as the owner, the star, the director and producer, even living in the theatre. Tree was followed by Frederick Harrison and Cyril Maude, the latter of whom, in 1905, left to take over the Playhouse Theatre. Harrison however stayed on until his death in 1927. The era was filled with fascinating productions, not least Somerset Maugham’s first venture in playwriting, ‘Lady Frederick’, Maeterlinck’s charming parable ‘The Blue Bird’, Ibsen’s ‘Ghosts’ and J M Barrie’s ‘Mary Rose’, starring the young Fay Compton, who was to return playing ‘Ophelia’; to John Barrymore’s ‘Hamlet’. 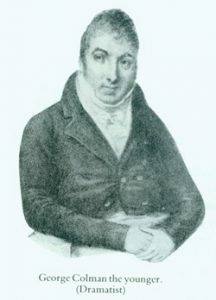 Harrison was succeeded by Horace Watson and he by his son Stuart. Many great names played over these years, including Ralph Richardson, Charles Lawton, Henry Ainley, Flora Robson, Noel Coward, Vivian Leigh, Dame Edith Evans and Donald Wolfoot, until, during the Second World War, John Gielgud headed a distinguished Resident Company, which included Peggy Ashcroft. Gielgud stayed in the theatre for weeks on end during the Blitz, taking up residence in Dressing Room No.10 and acting as Fire Warden, watching from the roof. Gielgud often referred to No.10 as his favourite room in any theatre, even ‘his favourite room anywhere’ and the famous Cecil Beaton portraits of Gielgud were taken here. By the 1960’s, the Theatre Royal Haymarket had become known as the home of the Classic plays and star-casts, as Louis Michaels and Producer Duncan Weldon brought in a host of major productions typified by N C Hunter’s ‘Waters of the Moon’, starring Ingrid Bergman. 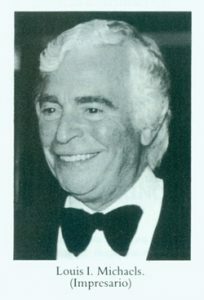 When Louis Michaels died in 1981, Arnold M. Crook, the present Chairman of the Company, took over, working with Duncan Weldon to continue this policy. Maggie Smith in ‘The Way of the World’, Peter O’Toole in ‘Man and Superman’, Vanessa Redgrave in ‘Orpheus Descending’, are just a few productions to have sparkled on the Haymarket stage in those years. The Theatre is still owned by Louis I Michaels Ltd and overseen by the Chairman, Arnold M. Crook. And then of course there are the Americans, Lauren Bacall, Claudette Colbert, Jack Lemmon, Omar Sheriff, Christopher Reeve all of whom crossed the Atlantic to play in notable revivals of great plays. Rex Harrison playing opposite Claudette Colbert in ‘Aren’t We All’, Edward Fox in ‘The Admiral Crichton’ with Harrison sadly in his last role at the Haymarket. Derek Jacobi as Alan Turing in the wonderful ‘Breaking the Code’. Jacobi as Thomas a Beckett opposite Robert Lindsay in Anouuilh’s ‘Becket’. Penelope Keith in Rattigan’s ‘The Deep Blue Sea’ and ‘Hobson’s Choice’. Robert Lindsay then returned to play the swashbuckling hero Cyrano de Bergerac and it is worth noting that HRH Queen Elizabeth II came to see this production together with members of the Royal Family to celebrate the fortieth anniversary of her ascension to the Throne. In turning away from the classics, the sheer variety of theatre has been immense: Paul Scofield and Vanessa Redgrave in Shaw’s ‘Heartbreak House’; Ben Elton turned playwright with ‘Gasping’ and Dawn French in ‘Silly Cow’. Dame Judi Dench in The Royal Family and Noel Coward’s ‘Hayfever’ and ‘Breath of Life’ alongside Dame Maggie Smith. Under the guidance of our Chairman Mr Arnold M. Crook (pictured left) TRH Productions has produced an eclectic range of productions including Wycherley’s ‘The Country Wife’ starring David Haig, Toby Stephens and Patricia Hodge, ‘The Sea’ with Dame Eileen Atkins and the world premiere of the Boublil/Schonberg/Kretzmer/Legrand musical, ‘Marguerite’ with Ruthie Henshall in the title role, the sell-out success of ‘Waiting for Godot’ with Sir Ian McKellen and Sir Patrick Stewart, the stage adaptation of ‘Breakfast at Tiffany’s’ with Anna Friel. The Trevor Nunn Season produced the critically acclaimed ‘Flare Path’ with Sienna Miller, James Purefoy and Sheridan Smith as part of the Terence Rattigan centenary as well as Sir Tom Stoppard’s ‘Rosencrantz and Guildenstern are Dead’ with Samuel Barnett and Jamie Parker, ‘The Tempest’ starring Ralph Fiennes and Nicholas Lyndurst, and James Goldman’s ‘The Lion in Winter’ starring Robert Lindsay and Joanna Lumley. The Theatre Royal Haymarket continues to inform and modify the British theatre landscape with a range of productions, showcasing some of the world’s most talented and celebrated performers. 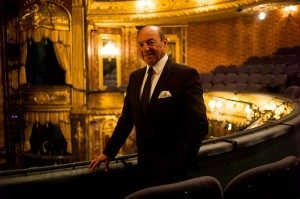 With the formation of Theatre Royal Haymarket Productions, and the continued growth of the Masterclass programme, the theatre continues to foster a home for actors, writers, directors, designers and audiences to come together and create the theatre for the next generations.